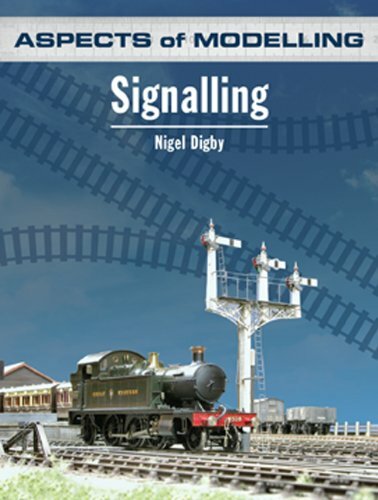 Signalling by Nigel Digby is aimed at the advanced modeller rather than the beginner, and while the subject of signalling is covered in some depth some initial knowledge is assumed. If all you want is to place some signals on your layout to look reasonably authentic, given the usual constraints of space, them this probably isn’t the book for you. A number of other reviewers have complained that the book is difficult to read and rather off putting. If you do want to signal a large layout accurately and have signals operating properly to control the trains then read on. Chapter one covers the relationship between layout design and signalling. Chapter two is about block sections. Chapter three is about the signal box – may be of use for background information about building and positioning a signal box. Chapter four is about signal types. Chapter five – points and locking. Chapter seven – modelling the signal box – mostly a list of available models or kits. However you are really directed to actually build a working signalbox. Chapter eight – finally – modelling the signals. A couple of pages and then a list of available kits. If you want to scratch build them you are advised by the author to buy another book! Then a few more pages on working model signals. Signalling is a vital component in the safe working of any full-size railway and yet it rarely gets the attention it deserves from modellers. In this volume in the well established Aspects of Modelling series, author Nigel Digby argues that it should, and leaves the modeller with no excuse to avoid proper signalling in their layouts. Subjects covered include: Design and placing of signals Signal boxes Available kits and components Lavishly illustrated with diagrams and photographs of models and the prototype, this book will convince any railway modeller of the necessity of signalling their layout. A must have for all keen railway modellers, regardless of scale or era.